There are plenty of places in Rotorua to find bubbling mud and steam vents, but the geothermal activity at Hells Gate is the most pronounced. Explore the landscape in this valley and you’ll notice that the steam is a bit thicker; the mud gurgles, a bit louder. The earth here is powerfully raw, which is precisely what makes the attraction so alluring. Hells Gate Geothermal Park’s wooden boardwalk create a safe path through the steaming chaos; the walk takes roughly 90 minutes to complete. Points of interest along the way include the Inferno pool; Kakahi Falls, the Southern Hemisphere’s largest hot waterfall; a native forest; and a mud volcano. After strolling the boardwalk, you can relax at a mud foot pool or soar high above Hells Gate on a helicopter tour. The mineral waters and mud, used for centuries by the local Maori people, are believed to have health benefits. The natural pools can easily reach above the boiling point; the hottest, Steaming Cliffs, registers temperatures over 250 degrees F (121 degrees C). Gain entry into the geothermal park and choose between curative treatments like a sulphur spa, mud bath, or a combination of the two. Private options are also available for those who prefer more privacy. Hells Gate is the only Maori-owned thermal park in New Zealand. Bring a bathing suit and towel, or rent them at reception. Wear comfortable footwear if you’re walking, and bring sunscreen in summer. Hells Gate Geothermal Park is located 15 minutes from downtown Rotorua on State Highway 30. There are complimentary round-trip shuttles that run several times a day, morning until late afternoon, with purchase of an admission ticket. The park is open from 8:30am–10pm every day except Christmas. Duration depends on the type of activity selected with admission; most therapeutic treatments last 60–90 minutes. You can also arrange a guided tours in the morning or afternoon; after 6pm, you can soak up a spa treatment under the stars. The playwright George Bernard Shaw first uttered the name “Hells Gate”; he reasoned that if hell were to have a gate, it would surely look like this. However, the site has held major significance to the Ngati Rangiteaorere iwi, or tribe, for more than 700 years. Tikitapu is the Maori name originally given to the valley; it’s named after a princess who ended her life by jumping into a boiling pool. Enter a world of bubbling mud and powerful geysers with admission to Hells Gate, a geothermal park in Rotorua. Once you’re in the Hells Gate park, you can follow a self-guided walkway through New Zealand’s most active geothermal field, pausing to explore interactive exhibits along the way. After the geothermal walk, take time to visit Hells Gate's native forest on a bush walk, listening for the sound of tropical birdcalls as you pass silver ferns and thick foliage. Fly by helicopter to White Island, New Zealand’s only permanently active offshore volcano. On this flight and volcano walking tour from Rotorua, the pilot soars over the Northern Lakes district with aerial views of the active crater before landing on White Island for a guided walking tour. Slip past steaming vents and colorful sulphur formations as you learn about the abandoned mining ruins left behind on its lunar-like landscape. 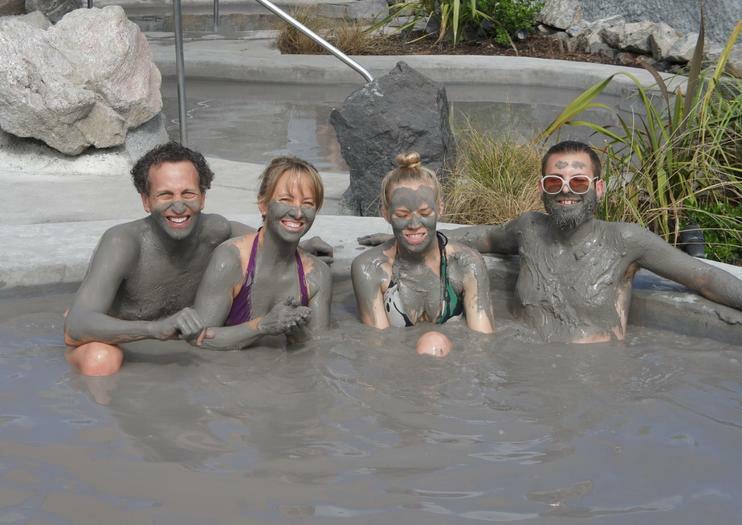 Treat yourself to a 1-hour therapeutic mud bath and sulfur spa package at Hells Gate Geothermal Park. Located in one of Rotorua’s most active geothermal zones, Hells Gate features mud bath treatments that leave your body rejuvenated and skin smooth. Have the option to cool off with a dip in waterfall pools after your treatment, and enjoy the ease of round-trip hotel transfers.